The Chinese Ministry of Education revised national liberal arts textbooks to cultivate love for the Communist Party. 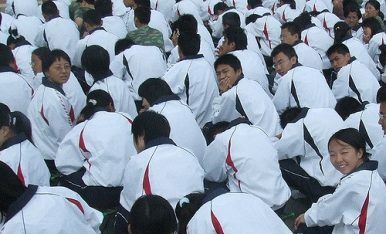 Every September 1 marks the first day of school in China. This year, when millions of Chinese students entered their schools, they found new textbooks — for Chinese language, history, and law and ethnics. Under the instruction of the Chinese Communist Party (CCP), the Chinese Ministry of Education took five years to revise all the liberal arts textbooks in order to enhance students’ “socialist core values.” All first-year students in primary and middle schools in China are now learning from the revised textbooks. The fundamental goal of the revision is to bolster student’s confidence about “socialism with Chinese characteristics,” and “fully implant socialist core values into youngsters.” The new textbooks, using Marxism as a guide, are aimed at reflecting the CCP’s new strategy. In order to achieve the goal, the Ministry of Education mainly focused on three aspects. First, the new textbooks add more traditional Chinese literature. A total of 129 ancient articles are included in the textbook for primary schools and 132 for middle schools. In the history and law textbooks, more “brilliant achievements” in Chinese ancient history were added, along with more emphasis on traditional values. Second, the new textbooks focus on strengthening the revolutionary tradition of the CCP. Chinese textbooks include a large number of articles about Mao Zedong, Deng Xiaoping and other CCP leaders. In the new history textbooks, there is more content regarding the War of Resistance Against Japanese Aggression. Previously, in textbooks China discussed the war as lasting for eight years, between 1937 and 1945, but in the new textbooks, China’s authorities have extended the Sino-Japan war period to 14 years, beginning in 1931. In addition, the related chapter highlights the brutality of the war with Japan and the CCP’s significant role in the war. Third, the new textbooks elaborate on Chinese President Xi Jinping’s more hard-line foreign policy, making sure that the students have a strong sense of China’s territorial situation. Concepts like “Tibet, Xinjiang, Taiwan, the Diaoyu Islands, and the South China Sea islands are historical and inseparable parts of China” are repeatedly emphasized. Undoubtedly, underlying the comprehensive revision of the liberal arts textbooks lies the CCP’s desire to shape the minds of the young generation, pulling them in line with the Party. The Xi’s administration has never been shy about this intention. But the national project of shaping the youths’ minds is not as easy as in the days of Mao; the cacophony of globalization and the access provided by modern technology provide a counterweight to the Party’s call. Why Did China Just Hear One More Mao-Era Phrase? China’s education minister said Chinese educators should cultivate reliable red and expert successors.